In a study published in Science this week, the researchers describe the dielectric properties of water that is only a few molecules thick. Such water was previously predicted to exhibit a reduced electric response but it remained unknown by how much. The new study shows that atomically thin layers of water near solid surfaces do not respond to an electric field, a finding that has very important implications for understanding of many phenomena where water is involved, including life of course. Water molecules are small and seemingly simple but nonetheless exhibit rather complex properties, many of which remain poorly understood. Among them is the ability of water to dissolve substances much better than any other solvent. Water is therefore known as the "universal" solvent. Behind this solvation ability is the fact that water molecules behave like tiny dipoles with two opposite charges placed at the ends of the molecule. This makes it easy for water to dissolve salts and sugars whereas substances like oils are repelled. The dipolar properties of water—or, as scientists call it, the polarizability—also play an important role in the structuring of the molecules of life, proteins and nucleic acids. 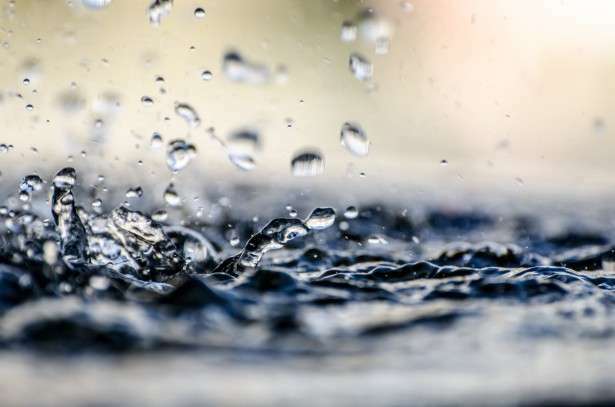 Therefore, it is hardly surprising that for many decades scientists tried to figure out how water behaves on a microscopic scale, in the immediate vicinity of other substances, solid surfaces and macromolecules. The quest has finally succeeded due to collaborative efforts of the groups of Dr. Laura Fumagalli and Dr. Andre Geim at the National Graphene Institute, the University of Manchester. They combined two recently developed technologies. First, the researchers created special channels that were down to several angstroms in size and accommodated only a few layers of water. Second, they introduced a technique capable to probe water's dielectric constant inside such nanochannels. Fumagalli who is the lead author and developed the measurement technique explained "The existence of a low-polarizable water layer near surfaces is central to many scientific disciplines, and its nature has been much debated for almost a century. To resolve the debate, it was necessary to develop new tools to controllably measure the dielectric constant on a very small scale. We have done this." The researchers have found that the electric response of the confined water is not only suppressed but completely absent. In other words, the water inside nanochannels was electrically dead with its dipoles immobilized and unable to screen an external field. This is in contrast to bulk water whose molecules easily align along an electric field. The thickness of the dead layer was found to be less than one nanometer, two to three molecules thick. Fumagalli commented "Water covers every surface around us. This layer is only a few atoms thick. We don't see it but it is there and important. Until now, this surface water was presumed to behave differently from the normal water famous for its anomalously high dielectric constant. How different, it was not known. It was a surprise to find that the dielectric constant of interfacial water was anomalous, too. However its polarizability is anomalously low rather than anomalously high." Geim added "This anomaly is not just an academic curiosity but has clear implications for many fields and for life sciences, in particular. Our results can help to improve the understanding of the role of water in technological processes, and why it is so crucial for life. Electric interactions with water molecules play an important role in shaping biological molecules such as proteins. One can probably claim that interfacial water shapes the life as we know it, both literally and figuratively." No article about this subject should ignore the https://www.struc...-science many years, yet he is windicated cowardly and silently. The truth rarely wins loudly. Because it isn't the truth, dumbo.